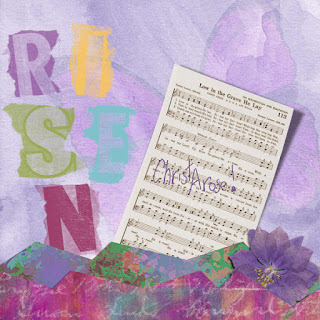 This fortnight Patter gave us a lovely old hymn which is often sung at Easter time - Christ Arose. "Each time I see the empty Cross, let me be reminded of your suffering and your victory, Lord Jesus." This is wonderful Anne-Marie! I love the butterfly showing new life and the Risen and the colors. Wonderful and now to get mine done! Beautiful work, Anne-Marie! 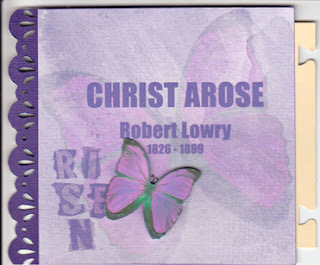 I really like the collage look of the first page and the way you've written "Christ Arose" across the hymn sheet! 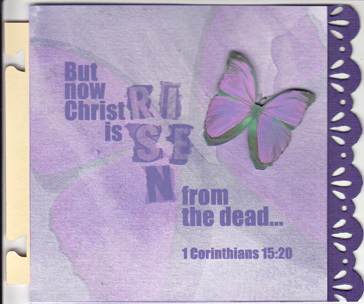 The next pages are so very pretty with the larger butterfly image in the background, the beautiful purple shades, and again the collage style!